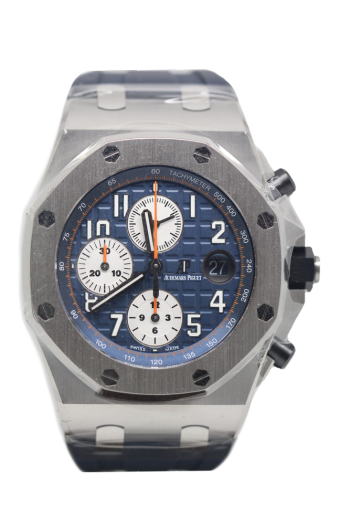 This stunning pre owned Audemars Piguet Royal Oak features both chronograph and date functions.The classic mega tapisserie dial is blue with orange and silver accents. A 42mm watch case in steel with a display case back and a matching blue rubber strap,the pin buckle is brushed steel . This watch as just returned from a full maintenance service at Audemars Piguet and comes complete with a 2 year service warranty. Cheshire Watch Company are supplying this watch complete with all boxes and Paperwork which is dated 2016.